National Meatloaf Day: Better Than Presidents Day. In honor of National Meatloaf Appreciation Day, October 18th, Serious Eats is holding a meatloaf event that we couldn’t resist being a part of. We’ve concocted a meatloaf made with a mix of ground beef and hot italian sausage and stuffed with a ricotta, goat cheese, and fresh herb filling. 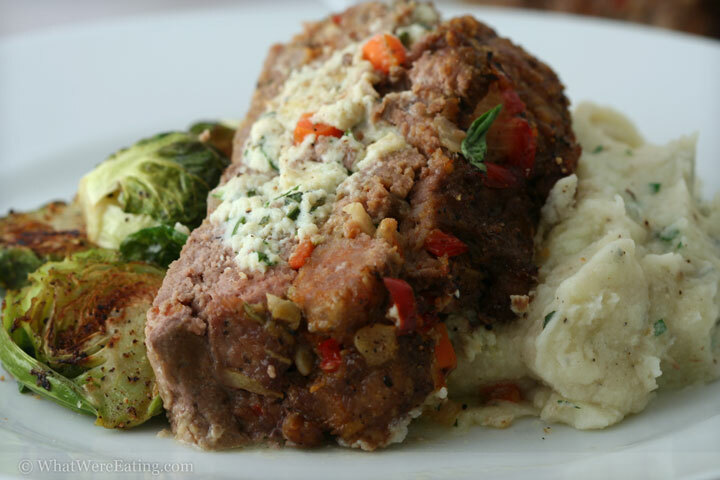 The meatloaf was served with roasted brussels sprouts and whipped goat cheese and herb potatoes. Rock on meatloaf… we appreciate you! The whole mealA: what is more american and needing of an appreciation day than meatloaf i ask you! what?!? T: mmm… i don’t know. I’m really trying to think of something clever here, but everything I think of was invented in germany. T: hot dogs were the first thing that came to mind. then hamburgers. Pretty sure there from germany, although i’m not sure, and apparently am too lazy to put together the 10-second google search it would take to find the answer. (looked it up. I was so right.) Let’s just say that meatloaf is about as american as it gets. A: and it for sure is deserving of appreciation. i love meatloaf. 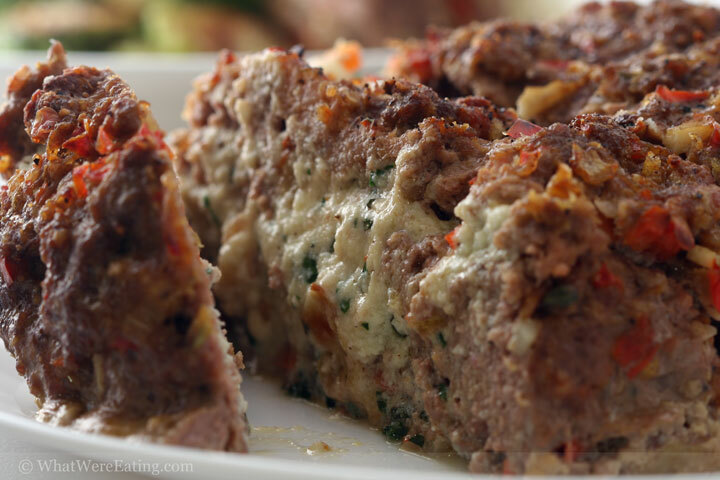 i’ve never made a stuffed meatloaf before… or one that used italian sausage in the meaty mix. i really dug this version, but it was a far cry from the meatloaf my mom made growing up. T: yeah, it was a far cry from my grandmother Ghee’s version too, which was pretty classic- ketchup on the top, etc. But, I gotta tell ya, that meatloaf has been done a zillion times. I was excited to try something a little different, and this delivered, sister, it delivered. Mmmm mmm that ricotta in the middle was goood. And I loved the flavor of the italian sausage in there. I’d say this could be good enough to eat over and over. It rocked. A: why thank ya T! like i said, i totally dug it too. i normally pay tribute to the classic style of meatloafing and do a tomato topping and everything…. but for appreciation days you’s gotsta think outside the box. the goat cheese and fresh herbs were really able to shine with the ricotta and bring out the flavors of the beef and sausage. while eating this meal i was really into getting a bite that consisted of a little bit of meat, filling, potatoes, and a brussels sprout. while that sounds like a big bite (it was!) the flavors just worked soooooo well together. T: I was not so ambitious with my forking maneuvers. I did enjoy mixing the potatoes with the brussels sprouts, but I was happy to eat the meatloaf by itself. It was gOOd. A: so, now that we’ve paid tribute to the mighty meatloaf, you got a rating for this bisnatch? T: I give it a 4.76/5. Pretty damn good stuff, woman. You done good. What do you think? A: i think i’m going to give it a 4.58/5. it was great. i’ve been on a really rich kick as far as cooking goes… maybe we’ll see a salad or something in the future, but for tonight i’m happy that there is leftover meatloaf for us to munch on! T: hell yeah, me too. Although I’ve eaten so much rich food lately that a salad is starting to sound pretty damn good. I guess i’m hungry now too, so that could have something to do with it. A: how about a meatloaf salad? T: I don’t think I’d want to adulterate the meatloaf by mixing it with salad. A salad with the meatloaf would be good though. A: alright! enough of this! a little less talk and a lot more action. let’s heat up some leftovers. T: that sounds fantastic. it’s tough blogging on an empty stomach. Hasta luego! Preheat oven to 350 degrees. Prepare the garlic bulbs to be roasted: cut the ends off of each bulb and drizzle with olive oil. Sprinkle with kosher salt and freshly cracked black pepper. Wrap in alluminum foil and roast at 350 degrees for about 1 hour or until just starting to caramelize and completely softened. Set aside until cool enough to handle. While the garlic is roasting, saute the veggies for the meatloaf. Add canola oil to a saute pan over medium heat. Once the pan and oil are hot, add the diced onions, carrots, and red bell pepper. Sweat the veggies over medium heat for about 10 to 15 minutes, stirring occasionally, until the onions are translucent. Add the minced garlic to the pan. Stir and continue to cook for 1 more minute. Remove from heat and set aside to cool. Once the garlic has been removed from the oven, begin preparing the rest of the meatloaf. To a large mixing bowl add the sauteed veggies, ground beef, italian sausage, parsley, bread crumbs, 1 egg, sambal oelek, worcestershire sauce, and a liberal pinch of kosher salt and freshly cracked black pepper. Using your hands, mix the ingredients together working the meat as little as possible, the more it gets rough around the tougher it will be. Stop mixing once all the ingredients are just barely combined. Make the filling, in a mixing bowl cream together the softened goat cheese and ricotta. Squeeze the roasted garlic cloves out of the bulbs and into the bowl with the cheese. Also add the parsley, sage, and mint. Mix until the garlic has broken up and the ingredients are thoroughly combined. Taste the mixture and adjust seasoning as necessary with kosher salt and freshly cracked black pepper. After adjusting seasoning, add one egg into the bowl, mix until the egg has been completely incorporated. Form the meat loaf. Place a piece of parchment paper onto a sheet pan. Using about 2/3 of the ground meat mixture form a rectangular "boat" on the parchment paper. There should be about 1 1/2 inches of meat on all sides and on the bottom with a large valley that will be filled with the cheese. Next, spoon the ricotta mixture into the bowl of the meatloaf "boat" ;-) . Not all of the cheese mixture may be necessary. Carefully take the other 1/3 of the ground meat mixture and press it out into a similar rectangle that will fit over top of the filled meatloaf "boat". Work the edges of the top piece of meatloaf into the sides of the bottom piece to for a sealed meatloaf. No filling should be visable. Drizzle with olive oil and sprinkle with freshly cracked black pepper and kosher salt. Place the stuffed meatloaf into a preheated 350 degree oven. Bake the meatloaf at 350 degrees for 1 hour. Some of the cheese may ooze out during the cooking process but that's okay. Remove the meatloaf from the oven and allow it to rest for at least 10 minutes before slicing and serving. Enjoy! PS: The leftovers go great cut up and tossed with pasta! I made meatloaf last night!!! You know what they say? Don’t let your meatloaf! I’mplanning on roasting a leg of lamb saturday, all day saturday, on a bed of potatoes, onions, turnips, and carrots. Oh yeah, I should be getting ten pounds of lamb bones also, and if I am lucky, we’ll be up to our eyes in pig trotters..
actually i love me some turkey meatloaf. This looks amazing, I can’t wait for the recipe! I too love to “stuff my loaf” but I usually stick to good old fashioned sharp cheddar. I think I am going to try this one out but with ground turkey and maybe spicy turkey sausage since we are trying to do the healthier eating thing. Please tell me which fresh herbs you used in the cheese mixture. I am trying to work with fresh herbs more these days but don’t really know how to mix and match them. Belive it or not, I’ve never had a good meatloaf. They’re hard to come by over here. I’m going to try your recipe when you post it. I love the idea of the stuffing too. I would love to know if ya’ll have a cookbook with these recipes in them. I would buy it in a heart beat. Your creates always sound wonderful, your images are excellent, and the dialog is hilarious! Yum – I have never heard of stuffed meatloaf or even considered it an option. But, I am ready for it! I never make meatloaf because although I WANTED to love the childhood meatloaf of my past, I realized I just don’t ever choose to make it. Thanks for the new idea! This looks amazing! I wonder if I can get my Husband to eat this, he likes “his dad’s recipe”. This is going into my files! Really have enjoyed reading your recipes .The meatloaf sounds good and love your web site keep the good work up .Thank You ..
Nice twist on an old classic. This meatloaf is awesome. It is now my favorite meatloaf recipe. I loved the goat cheese and ricotta combo…but it might also be good with some gorgonzola….